While some employers use formal employment contracts when they hire a new employee or promote one of their existing employees, employers in New York and New Jersey often use informal offer letters instead. An offer letter can be as simple as a sentence or two listing some basic information about the position, as detailed as a formal written employment contract or anywhere in between. They typically list your job title, start date, salary, benefits and any applicable bonus or commission plans. They also frequently include additional information about your job duties, responsibilities and hours, vacation time, sick time and other paid time off, as well as an overview of other important employer rules, policies and procedures. Is My Offer Letter Legally Binding? 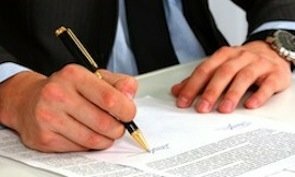 Whether an offer letter is legally binding depends on the circumstances, starting with the language of the document itself. For example, if it sets forth your salary and benefits, then you probably are entitled to receive that salary and benefits for as long as you remain employed, unless and until you are notified about or agree to a change to your compensation. Likewise, if it includes any guarantees, limits the employer’s right to fire you, or promises you anything else, those promises can be legally binding. However, as with any other employment agreement, it is common for offer letters to make it clear that you are an employee at-will, meaning you can be fired (or resign) for almost any reason or for no reason at all as long as the employer does not engage in unlawful discrimination or retaliation or violate another one of your employment law rights. Similarly, written job offers frequently include disclaimers. A disclaimer usually indicates that the employer is not legally bound by some or all of the promises set forth in the letter and makes it difficult or impossible to enforce those provisions. However, even if there is a disclaimer, employers usually cannot change your compensation or benefits retroactively, meaning they cannot reduce your salary after you have already performed the work and cannot take away a guaranteed bonus or commission after you have earned it. Should I have an Employment Lawyer Review My Offer Letter? As with most other employment contracts, it usually is a good idea to have an experienced employment lawyer review an offer letter before you formally accept the job. There might be terms you can improve, eliminate or clarify, such as severance pay provisions, non-compete agreements, non-solicitation clauses or mandatory arbitration requirements. In addition, there might be similar terms that after consulting with a lawyer you might determine are unacceptable and would convince you not to accept the position. If you have received an offer letter in New Jersey or New York and would like an employment lawyer to review it for you, then Rabner Baumgart Ben-Asher & Nirenberg, P.C. can help. We are experienced at reviewing and explaining job offer letters, as well as negotiating executive compensation and other employment contracts. You can either call us at (973) 744-4000 or contact us online to schedule a meeting with one of our employment law attorneys. Our office is conveniently located at 52 Upper Montclair Plaza in Upper Montclair, New Jersey.